The Smart Contract Connectivity Problem, is the inability of a smart contract to interact with any external data feed, or other resource that is run outside the node network in which the smart contract itself is executed. The decentralized nature of smart contracts that makes them tamper-proof, also removes their ability to access key contractual performance data, denying them the use of any & all web APIs, as well as precluding them from utilizing important existing outputs like bank payments. This lack of external connectivity is inherent to all smart contract networks, due to the method by which consensus is reached around blockchain transactions, and will therefore be an ongoing problem for all smart contract networks. As they say, every era comes to an end and in this case it’s the end of centralized value exchange. But from every end, rises a new beginning, and that beginning is decentralized value exchange through the use of smart contracts. Connection, security, data driven, and monetization are features that will be vital to the future ecosystem of smart contracts, which is why Chainlink is in a prime position to be the centerpiece of it all. 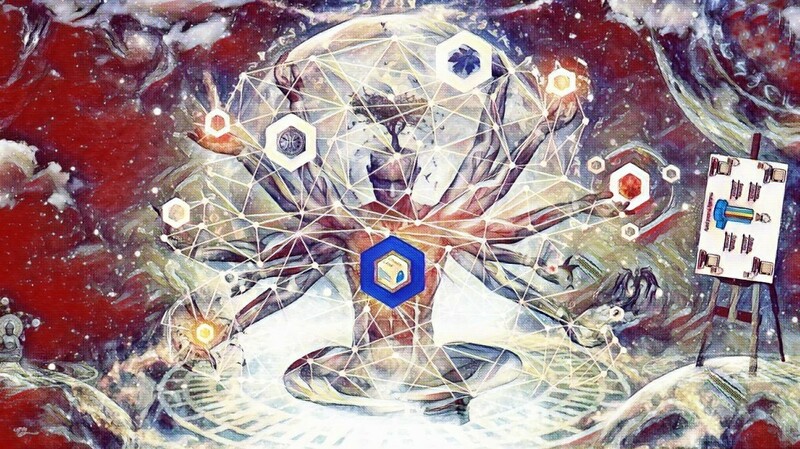 If Chainlink reaches its full potential, it could complete the God Protocol, perfecting the first trustless third party in world history. This is likely to obsolete many current blockchain projects and the ramifications are bigger than most people understand. Klaus Schwab, founder and head of the World Economic Forum, described this phenomenon of decentralized trust in a book called The Fourth Industrial Revolution, in which he even mentioned SmartContract.com by name. So with all that’s been said, the choice is yours: watch from the sidelines or take a risk on what could be one of the most valuable pieces of digital real estate heading into the future. We believe that most decentralized applications will need to utilize middleware to incorporate value added services beyond the computational power provided by blockchains. Therefore, we believe critical pieces of middleware technology (i.e. ChainLink) will capture similar amounts of total transaction volume and proportional value as the blockchain platform (i.e. Ethereum) providing computing power for decentralized applications.